can anyone recommend some good surfing/sailing sunnies? Lip sunglasses work a treat for me. Not cheap, but I think you get what you pay for. I've used the Seabreeze sunnies for years, gone through a few sets, done the job. Get the Lip sunnies. I posted a thread on these I while back. Agree, these are my preference and while they are pricey I think they are worth it. Never needed to apply any water repellent in the near two years in using them and recently I couldn't find them and went back to my old Seebreeze glasses. I tore the house down till I found them as I think they are that good. Any polarised sunglasses. Get cancer council ones. Usually 40 bucks. Add a head strap. Sometimes chemists shops have them at two for $20, Get two. Definitely get polarised lenses, but be aware that polarisation quality can vary. 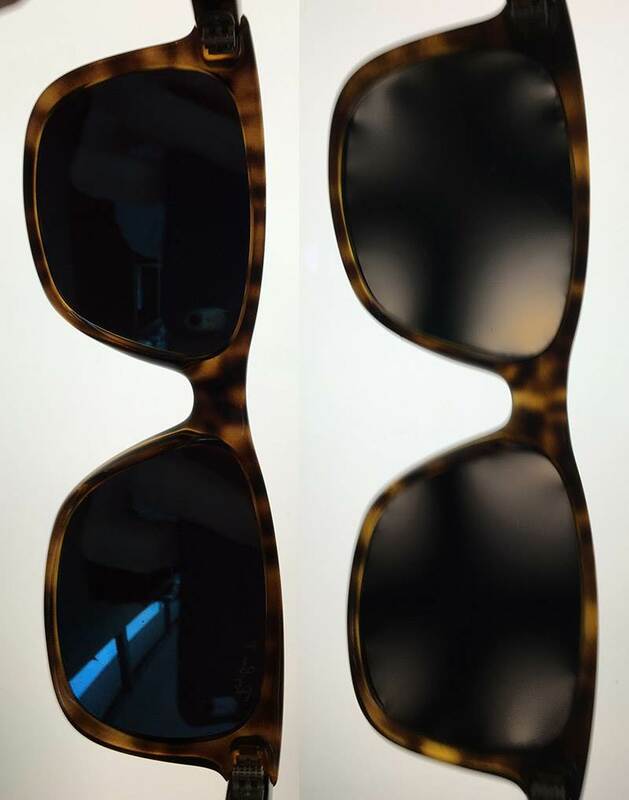 I got some prescription polarised lens for my Ray Bans from an online supplier, and the quality of the polarisation was very disappointing. You can test polarisation by holding the glasses up to an LCD laptop screen or monitor. When held horizontally the glasses should be quite transparent and when held vertically they should be totally opaque. 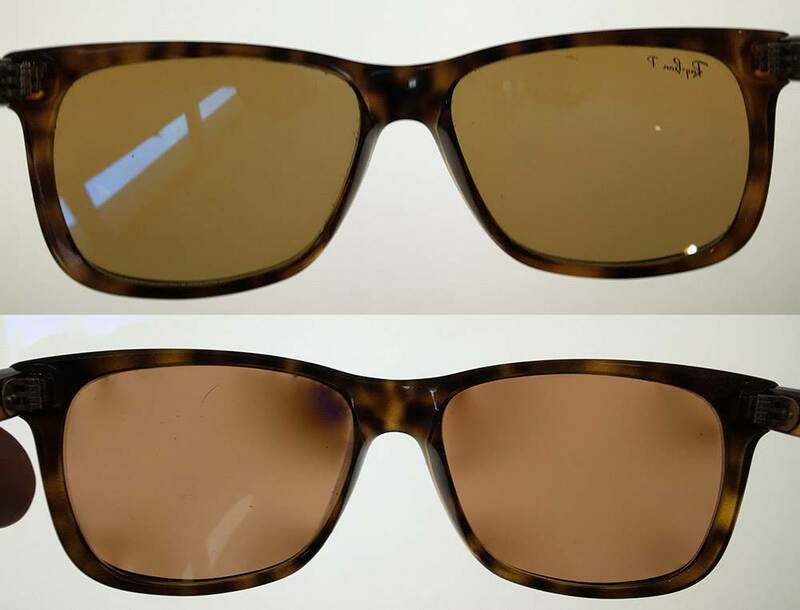 You can see in the images below that my replacement lenses were blotchy in both orientations when compared to the genuine Ray Ban polarised lenses. I've also heard similar things about some cheap Chinese polarised sunglasses, so check before you buy. Bomber sunglasses are good. They have a foam insert that allows them to float if they come off. Lost a pair of prescription sunnies today. DOH !!! I used to use cheap safety glasses but now i would find it hard to find my way back to where I launched. I had a big catapult faceplant. Prescription glasses stayed on, but i blew a lense right out of frame. Couldnt work out why my vision was screwed as i sailed back in. Went to wipe the glasses clean, no lense!!! Maui Jim make great watersports glasses. Maui Jims are supposed to be doing if not the best, at least some of the very best sunnies in the world. I have a pair of their Spartan Reef, I'd gladly get me another pair some time soon in case I lose mine. Expensive but you do get what you pay for, the frame is top notch and the polarized lenses really are the best you can get out there. Any cheap sunglasses are good as to be sold in Australia as 'sunglasses' they must pass the design standard which specifies a minimum UV protection. = same as pretty much all expensive sunnies. I use safely sunglasses from the safety store as they wrap around and protect more from side rays. And they dot hurt when I lose them in a crash. Prescription lenses. Nah....not me. More excitement and thrills if you cant see so much. They've got some good wrap-around styles that will still take script lenses.Mine are about 3 years old now - 'Rush' style - they have predrilled holes in the ear bars - so great for attaching a proper lanyard - not just head strap. And being full polarised, perscription lenses ($$$!!!) ...I definitely want them attached to my wetty or vest securely. (they don't float) Water beading/repelling is not as good as it was when they were new though but they have copped a beating - with no other issues, lenses are still clear - no scratches, which is pleasantly surprising considering the punishment dished out. Polarised UV wraps from Bunnings for $29. All sunglasses end up fogging up, get wrecked by the salt water eventually. I use Oakley racing jackets with hydrophobic solution on them. You can change lens on them and they have a strap around the back. I know they're a little more $ but I love my Oakleys And they last for years. Whatever you get make sure you get a small hole drilled in one of the arms. Tie a normal sunnies leash on with fishing line through the hole and one end and tie the other end to your buoyancy vest or something similar. That way if you have a stack and they come off you won't lose them. the Bunnings polarised ones come with a small hole at end of the arms. I use very small cable ties to tie on leash. been using one pair for both work and windsurfing since November and still going strong. Cost no more than $30 - highly recommended. ^^ Is that the whipper snipper style? Can't wait to get a pair n look like all those grannies n granpas wearing em over their prescription glasses. WAAAY COOOOL. Sounds great except I need prescription ones..
so damn cool I'm hot baby! Just wear your normal glasses and get some ski goggles to wear over the top! Another option, depending on your prescription, is to get some daily disposable contact lenses. Then you can wear cheapo sunnies over the top. I have done that for many years but unfortunately the contacts only correct my distance vision and now my eyes aren't good enough to focus close up with the contact in. That makes sorting knots out etc difficult but is mainly a problem with the fine lines used in kitesurfing, I can get by windsurfing. Good wrap arounds help prevent losing lenses. I have lost one or two over the years but they work out about 50c each so not a big deal! An extra layer to get fogged up..